Wood: Trubisky Was Good in 2018. But He Can Significantly Improve – Da Bears Blog – Last year, I looked at Mitchell Trubisky’s rookie season and found that, by the end of the year, he was statistically performing like a league average quarterback in every area except throwing touchdowns. So that was his challenge for 2018: throw more touchdowns without getting worse everywhere else. Medina: Eric Reid’s New Contract Probably Set Up Adrian Amos For a Big Pay Day – Bleacher Nation – Adrian Amos could benefit from Eric Reid’s contract by landing a big deal of his own in free agency. Bears announce key offseason dates – ChicagoBears.com – The NFC North champion Bears on Monday released a list of important offseason dates, highlighted by two minicamps, 10 OTA practices and the Bears100 Weekend Celebration. Medina: Allen Robinson Played Through Fractured Ribs in the Playoffs – Bleacher Nation – It turns out Allen Robinson played his best game as a member of the Bears through a pretty serious injury. 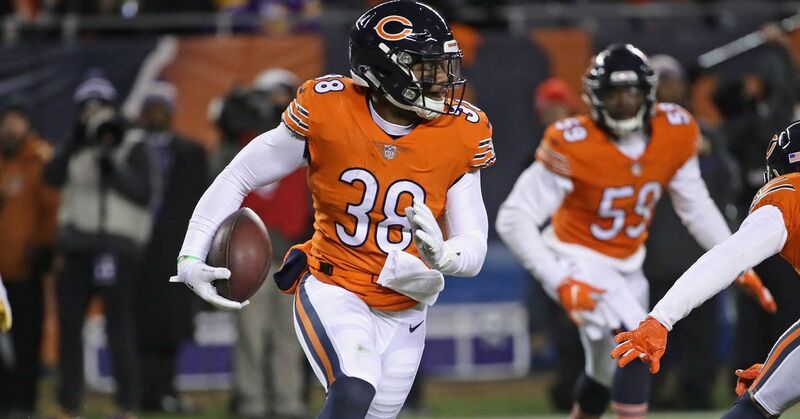 Emma’s Bears Offseason Outlook: Cornerback – 670 The Score – The Bears face a decision on free-agent nickel corner Bryce Callahan. Price: Bears likely to play NFL season kickoff and Thanksgiving Day this year: report – Sun Times – The Bears and Lions may be gearing up for a holiday rematch in November. Biggs: Kareem Hunt signing with the Browns saves the Bears a potential headache as they seek help at running back – Chicago Tribune – The Bears’ interest in Kareem Hunt became a moot point Monday when the Browns signed the troubled running back. But even with Hunt off the market, the Bears can still upgrade at running back this offseason. Campbell: The Browns – not the Bears – sign running back Kareem Hunt – Chicago Tribune – The Browns signed running back Kareem Hunt, ending outside speculation the Bears would pursue reuniting the NFL’s 2017 rushing leader in Chicago with coach Matt Nagy. Campbell: The NFL is reportedly considering Bears-Packers for a Thursday night opener at Soldier Field. What’s not to love? – Chicago Tribune – The Bears could host the Packers in the NFL’s annual Thursday night opener, according to a report Monday by the SportsBusiness Journal. Stankevitz: As Kareem Hunt signs with Browns, Bears’ search for a running back looks elsewhere – NBC Sports Chicago – The Bears may have jump-started the market for Kareem Hunt with Matt Nagy’s comments in January, but they won’t sign him as the running back landed in Cleveland on Monday. Stankevitz: Primetime, Thanksgiving games reportedly on tap for Bears’ 2019 schedule – NBC Sports Chicago – Expect the Bears to play in primetime plenty in 2019, as well as a return trip to Detroit on Thanksgiving, per a report by Sports Business Journal. Bears 2018 position review: Defensive line – ChicagoBears.com – A monster season from Akiem Hicks helped the Bears win the NFC North title and land the veteran defensive tackle in his first career Pro Bowl. African-American pioneers in Bears history – ChicagoBears.com – In honor of Black History Month, ChicagoBears.com features three African-American pioneers in franchise history, including Willie Thrower, the NFL’s first African-American quarterback. Panucci: “Survey says, …” TWT: The Alliance of American Football – Our Turf Football – A new football league has begun. OTFB’s Liz Panucci shares a few tidbits + wants to know your thoughts on the Alliance of American Football. Rosenthal: 5 things about the Alliance of American Football’s debut, plus Bob Costas tees off on the NFL – Chicago Tribune – Here are some thoughts about the Alliance of American Football’s CBS debut this weekend, filling a post-Super Bowl void for fans so eager for games that they’ll watch teams they know and care little about. The football wasn’t bad. Plus Bob Costas goes on ESPN to talk about NBC, the NFL and brains. Trent Richardson penalized because AAF wants to keep its high-tech footballs – ProFootballTalk – The Alliance of American Football has made data analysis a top priority, and part of that is putting chips in every football to track the speed and trajectory of balls that are thrown and kicked. Unfortunately, that means no giving footballs to fans as souvenirs. Browns did not talk to woman in video during “extensive research” on Hunt – ProFootballTalk – Browns General Manager John Dorsey defended the team’s signing of running back Kareem Hunt in a Monday afternoon press conference. Dorsey said the team did a thorough investigation of Hunt, which included talking to domestic violence support organizations in Kansas City. A’s “caught off-guard” by timing of Kyler Murray’s announcement – ProFootballTalk – The Oakland A’s knew that Kyler Murray could choose to play football. The A’s didn’t expect the decision to come so quickly. Bob Nightengale of USA Today reports that the A’s were “caught . . . off-guard” by the timing of Murray’s announcement. Eric Reid signs 3-year, $22M deal with Panthers, sets the market for free agent safeties – Acme Packing Company – With this data point in place, what will players like Earl Thomas or Landon Collins demand in free agency? 22 former Packers were on opening-week rosters for AAF teams – Acme Packing Company – Players who spent time in Green Bay are well-represented in the new football league. Bob Quinn: Lions considered Kareem Hunt, but decided they “want good people” – ProFootballTalk – Before the Browns signed running back Kareem Hunt, plenty of teams considered adding him. The Lions were one of those teams, and they ultimately decided not to pursue Hunt. “We evaluate every player on the field and off the field and in this case, we talked about internally,” G.M. Kareem Hunt “extremely grateful” for opportunity to earn Browns’ trust – ProFootballTalk – Running back Kareem Hunt signed a one-year deal with the Browns on Monday to open a path back to the field after being released by the Chiefs last year. Jahns: Bears offseason 2019: Browns sign running back Kareem Hunt – Sun Times – The Browns signed controversial running back Kareem Hunt to a one-year deal. Telander: Former Bears OL Dan Jiggetts has learned he doesn’t have to live in pain – Sun Times – For Jiggetts, 64, the pain from old football injuries to his shoulder, back and hips began to take over his life some time ago. Wiltfong’s Chicago Bears 2019 Roster Turnover: How big a need is cornerback? – Windy City Gridiron – In this 13 part series we’ll take an in depth look at each position group for the Chicago Bears with an eye towards the 2019 season. We’ll speculate on who stays, who goes, and some potential additions we’d like to see general manager Ryan Pace make. Infante’s 2019 NFL draft: 6 running backs the Bears should keep an eye on – Windy City Gridiron – What the Bears will do at the running back position this offseason is anyone’s guess at this point, but one can assume that drafting one is likely. Schmitz’ Bear With Me: Championship Windows, Adrian Amos vs Bryce Callahan, and NFL Officiating vs the AAF – Windy City Gridiron – On the latest episode of Bear With Me, Robert S. discusses how long great defenses last before predicting the Bears’ championship window length. He also weighs in on the Amos vs Callahan debate and talks about what the NFL’s officiating could take away from the AAF.